Group of doctors and nurses in a hospital. Photo courtesy of Shutterstock. 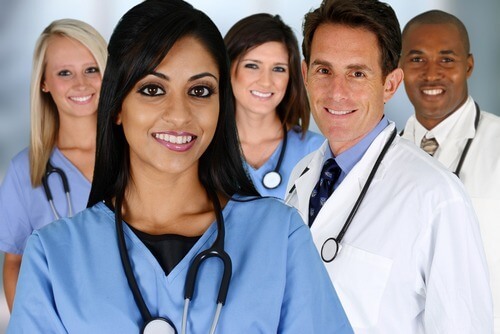 Becoming a Licensed Practical Nurse (LPN) or a Registered Nurse (RN) is a great accomplishment, and there are many good paying, traditional nursing career paths that both LPN’s and RN’s can pursue upon completion of their degree. But there are even more opportunities for career advancement – along with increased salary, for registered nurses who pursue advanced nursing degrees. In fact – be sure to scroll down to the bottom of this article to see a comprehensive list detailing advanced nursing career paths – as well as a cool infographic detailing nursing careers by degree and pay. Obtaining advanced nursing degrees is a challenge, but worth it for the nurse who aspires to continue to advance in their professional career. Once a nurse becomes an RN they can then focus on advanced degrees or specializing in an area of patient care, such as labor and delivery, pediatrics, or trauma (ER), points out Kerri Hines, MSN/Ed., RN, Department Chair for nursing at San Jacinto North Campus. San Jacinto College offers various nursing programs, including a Vocational Nursing (VN) Program, Registered Nursing (RN), and LVN – RN Transition Program. These programs provide an opportunity for students to have multiple pathways into a nursing career. The Vocational Nursing Program is a one-year program that prepares a graduate to work as a Vocational Nurse. Licensed Vocational Nurses work in hospitals, long-term care facilities, clinics, home health, schools, and other health care facilities to provide basic care to patients. “These specialty areas usually require a RN degree and keen assessment and clinical reasoning skills,” says Hines. Nurses can also pursue nursing certifications, which allow nurses to demonstrate one’s knowledge and experience in a particular area, says DeWitt. Nursing certifications are available for registered nurses and advanced practice nurses depending on the program. In addition, current LPNs may be able to waive a portion of the RN program depending on their previous experience and the College or University admission requirements. Generally, transitioning from LPN to RN will involve taking general education courses, admission to and completing an accredited RN program and then registering for, and passing the NCLEX-RN examination. It’s a great time for nurses passionate about education, patient care and career advancement. Those who have some real world experience may be able to better understand the path they want to choose, and once they find that niche, the possibilities and opportunities are endless. For example, Forensic nurses are critical resources for anti-violence efforts. Forensic nurses collect evidence and give testimony that can be used in a court of law to apprehend or prosecute perpetrators who commit violent and abusive acts. If a nurse is interested in clinical practice, the Nurse Practitioner and Doctor of Nursing Practice (DNP) degrees will give them the skills to be experts in the field. Monmouth offers Forensic Nursing, Nurse Practitioner and DNP programs, but not all colleges and universities do; so any nurse looking to specialize, needs to thoroughly research their educational options. Advanced degrees prepare nurses to apply evidence-based findings to their clinical practice. DNP nurses practice at the highest educational level and have an equal place at the table with other doctoral level professionals. Health Informatics Technology: With the ever-growing integration of information technology in hospitals and other patient care facilities (including the advent of the Affordable Care Act requirement for electronic health records), this field continues to expand, says Dr. Kim Hudson-Gallogly, head of the University of North Georgia’s Department of Nursing. UNG has developed courses and degree options that can augment the traditional nursing degree and provide skills to meet the demands of the technology boom. Besides the nursing education needed for this pathway, it is essential that the nurse have extensive information technology course work to help the nurse manage data and processes associated with health informatics. To that end, nurses or students interested in this career path would do well to gain a good deal of experience in computer science. To market yourself effectively, hospitals and other care facilities will want to know how your skills can help them manage and process patient data. “Employers will be especially interested if you can showcase innovative software or programming talents that will make their other departments and employees more efficient at their own work,” says Hudson-Gallogly. Clinical Trials Research: This field has become even more important as the push for research has increased across all patient care facilities, says Hudson-Gallogly. In this position, nurses study medical strategies, treatments and devices, and ascertain whether they are safe and effective for humans. A successful clinical trial typically reveals that the strategy or device in question either improves patient outcomes, offers no benefit, or causes harm. Registered professional nurses meet part of the requirements for this role with their extensive patient care experience, decision-making skills, and organizational skills, which are all essential abilities for the research nurse. However, nurses in this field will study more extensively in the hard sciences than their practice-based counterparts, as they will need to be exceedingly proficient in the scientific processes behind testing new treatments and devices. UNG is currently in the process of developing a clinical trials research degree for health care professionals that will launch in 2018. Operating Room Nurses (or perioperative nurses): These nurses require a specialized skill set that includes being extremely organized, possessing a strong problem-solving ability, and being technologically savvy. While this pathway requires licensing as a registered professional nurse, it is so highly specialized that it is difficult to recruit and retain qualified applicants. As a result, there is a shortage of these nurses, says Hudson-Gallogly. Operating room nurses have the serious responsibility of planning for and supporting successful operations and surgeries, which includes a great deal — accurate and thorough patient assessment, detailed diagnoses, operating room suite planning, timely intervention when a an issue is identified, and vigilant evaluation once the patient has undergone a procedure are all critical functions of this nursing role. UNG has developed an introductory course to generate interest in this field in an effort to meet the needs and demands of the hospitals and ambulatory surgical sites. In 2018, UNG will launch a certificate that will prepare the nurse to be better prepared and more successful in this field, said Hudson-Gallogly. Home Care Nursing: A home care nurse can provide intermittent care to home bound patients (visiting nurse) or provide around the clock care to patients requiring skilled nursing care. “Registered nurses need the skills to assess not just the patient, but the home care environment to ensure that the patient is receiving adequate care,” says Dr. Patricia Burke of Touro College School of Health Sciences Department of Nursing. The home care nurse needs to work independently and make clinical decisions coordinating care with other health care professionals (social worker, occupational and physical therapy) and providing comprehensive reports to the physician and insurance companies. One of the benefits of home care nursing is the flexibility and the ability to arrange visits to meet the nurses’ preferences. For instance, the nurse can arrange to conduct visits while their children are in school. Weekends and holidays are usually covered by per diem or on-call nurse, another added bonus. A baccalaureate nursing degree is preferred but not required to become a home care nurse, however, at least one years’ experience as a nurse is required. For a specialty home care nurse, such as pediatrics, two years’ experience may be required. With home care nursing experience and a baccalaureate degree nurses can progress to coordinators of care, supervising home care nurses and ensuring that documentation of care meets regulatory standards. Occupational Health Nurse: The occupational health nurse (OHN) needs basic assessment and education skills. The focus of the OHN is on the identification of workplace hazards, education regarding prevention and safety of employees, and preventive care. OHN’s also conducting employee risk assessment with management, compliance with Occupational Safety and Health Administration (OSHA) regulations and training for industry specific safety issues. “A benefit of being an OHN is that the hours are regular with no weekend or holiday requirement,” says Burke. Research Nurse: A research nurse can function at all levels of research from obtaining consent, collecting the data through analysis and dissemination. “Attention to detail is one of the most important skills needed for a research nurse,” says Burke. Research nurses can work in pharmaceutical, medical, or nursing intervention trials. This job requires excellent written and verbal communication skills, a knowledge of the research process and clinical expertise in the area studied. Most research nurses will work Monday through Friday, 9-5, with weekends and holidays off. If the research nurse is working for a pharmaceutical company their position may involve travel and evening seminars to disseminate findings. The minimum requirement for a research nurse is a baccalaureate degree, however a Masters is preferred. As nurses further their education and gain experience, more formal leadership opportunities arise. To learn more about nursing careers and other health care opportunities, stay connected to College Recruiter. Start by registering with College Recruiter to have job alerts emailed to you. Then visit our blog, and connect with us on LinkedIn, Twitter, Facebook, and YouTube. Recent college graduates who have applied for jobs can become impatient if they feel it’s taking too long to hear back from employers. In the following post, learn how they can follow up by applying these seven rules. Proper follow up is an integral piece of your job search, and how you execute can make or break your chances at snagging an interview, or even an offer. And while we live in the digital age where immediate information at our fingertips is the norm, it’s not quite the way the hiring process works. Before graduating and going after entry level jobs, students may want to know these 12 things found in the following post. Is a Resume or LinkedIn Better for Your Entry Level Job Search? Most people would probably say that using a resume or LinkedIn for your entry level job search is a smart move, but is one actually better than the other? Learn more about both in the following post.